Well, an advanced copy of Under A Blue Flag just arrived. The cover looks great. 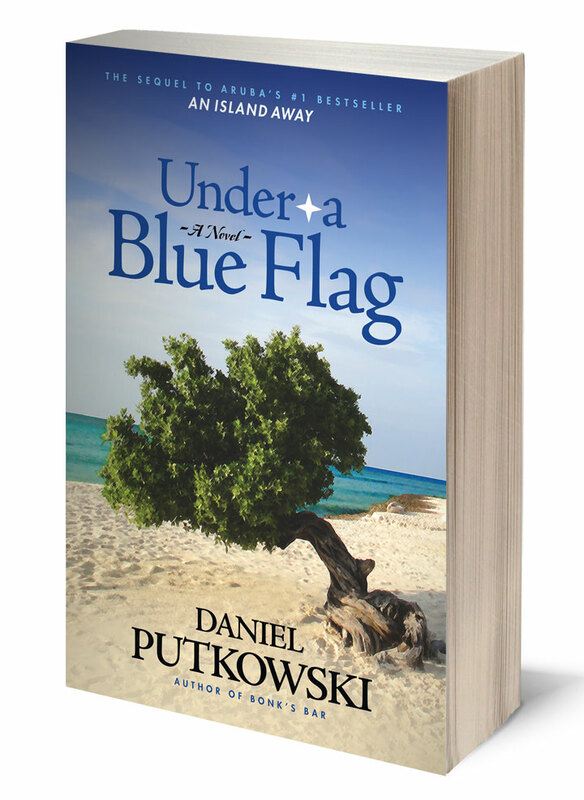 Under A Blue Flag is the sequel to An Island Away, my first book about Aruba. I highly recommend reading the first book before starting the second. Rest assured, your favorite characters are back. The book is schedule for release during the first week in February. It will also be available on Amazon’s Kindle. As the newspaper below tells the story, fiction has become fact. Dechi Bislip, a local fisherman here in Aruba, was separated from his boat off the southeast corner of the island. Bislip comes from a family of strong swimmers and fisherman with roots in the town of Savaneta. Lucky for him. He swam and drifted along the coast of the island, eventually managing to save himself. In my novel, An Island Away, there is a scene where Captain Nathan Beck finds himself adrift at sea a bit farther away than Bislip. However, Beck’s course follows one very similar to Bislip’s. Beck ultimately comes ashore in Savaneta, not far from Bislip’s family homestead. Here is the cover of the Diario that related Bislip’s adventure. The previous post showed photos from one of my book signing events in Aruba. During the course of a previous event that week, I met a fellow from Poland, John T. He had the most fascinating life story I’ve heard to date. First, here is a photo of John and I, on his 84th birthday. John was in the Polish Underground during the Second World War. He fought the Nazis and the Russian Communists. His brother was involved with another resistance group which was sometimes at odds with John’s. As the war came to an end, John escaped from Poland (to avoid the Soviets) and ended up in Germany of all places before making his way to America. He was very successful in business and now visits Aruba, Poland, and other places every year. What a guy! You never know what a person has accomplished until you take the time to speak with them for a few minutes. I have the good fortune to be able to engage people from all over the world and all walks of life at my book events and in my travels. This is one of life’s great pleasures that I can not say enough about. It’s better than anything on TV; that’s for sure. So get out there and talk to somebody! John, it was an honor to meet you and shake your hand. I wish you another 84 years and the best of everything. You earned it! The story told in An Island Away, takes place in Aruba, Dutch Caribbean. I have the good fortune to live on the island six months of the year, and thus, meet many people interested in the book. Here are some photos from a book signing event at the Tamarijn Resort. It’s a true pleasure to meet people who have read the book or heard about it and want to know more. I’m surprised at the questions asked, which actually serve as inspiration to keep writing. After all, if a reader wants to know more or found something particularly interesting, it is a cue to include it in the next story. Of course, hearing people’s stories about Aruba is also fascinating. There are many visitors who have been going to the island for 20 or 30 consecutive years. That’s quite a few frequent flier miles. Aruba is a wonderful island full of nice people, good restaurants, and fringed by beautiful beach. However, I don’t write much about that part of Aruba. I write mostly about the refinery boomtown of San Nicolaas. It was here that I came in 1994, when I first visited the island. It’s a strange place, full of characters and stories, all of which are incredible when understood in the context of the Caribbean. My thanks go out to all the people who have bought and read An Island Away. Similarly, I would like to express my gratitude to the staff of the Tamarijn Resort as well as all the retailers on the island who have helped make it the best selling book in Aruba for 2008.